El Salvador joined the Latin American Revolution in 2009 when the people voted for the leftist Farabundo Marti National Liberation Front (FMLN) party under the leadership of Mauricio Funes (see “El Salvador the latest Latin American country to turn left” in the June 2009 Monitor). The election replaced the 20 year-old rule of the fascist ARENA party with a government willing to work with social movements to bring about changes to the country’s social economy. The revolution can continue with the re-election of the FMLN in elections this March. During FMLN’s second term, under new President Salvador Sánchez Cerén, the government has deepened its collaboration with social movements in El Salvador as both try to repair the environmental and economic damage caused by two decades of unrestrained neoliberalism. The FMLN has long-standing close links with progressive social movements that influence its policies, especially in the critical areas of mining, water rights and agricultural policy. The “government is committed to working with the environmental movement to develop a national environmental agenda based on the logic of ‘Living Well’ ”, confirmed FMLN officials after their election victory. “Living Well” is the Sanchez Ceren government’s philosophy and was made popular by President Evo Morales of Bolivia (see “Morales and social movements continue to transform Bolivia” in the July–August Monitor). The philosophy strives to harmonize economic development with community and ecological needs, and cultural diversity. However, unlike the Morales government, the Sánchez Cerén administration is hampered in El Salvador’s legislative assembly, where despite winning the most seats, a majority is held by right-wing parties. This restricts the FMLN’s ability to implement the progressive policies social movements want it to. Despite this limitation, social movements are now partners in policy-making with FMLN governments. This is in stark contrast to the ARENA years, during which opponents from civil society were jailed and charged with terrorism. Hugo Flores Hidalgo, the former director of CORDES, a prominent agricultural social movement organization, was made vice-minister of agriculture by the FMLN during the Funes administration—a post he continues to hold today. Angel Ibarra, an influential environmentalist, was named vice-minister of the environment this year by President Sánchez Cerén. Although the Sánchez Cerén administration is in its infancy, “it has shown an openness to the anti-mining and water protection social movement organizations,” adds Salazar. He offers by example the invitation extended by a high-level cabinet delegation to meet with environmental activists attending the World Environment Day march in San Salvador [El Salvador’s capital] this June. Pedro Cabezas, the San Salvador-based co-ordinator of the group International Allies Against Mining in El Salvador, agrees there are generally positive working relations between the FMLN and social movements. These are “carried out in the context of a democratic dialogue where social movements are permitted to inform government policy,” he says. The environmental movement “is able to inform government policy in numbers of ways,” adds Cabezas, including through internal channels within the FMLN party, through the legislative assembly and through the ministry of the environment. 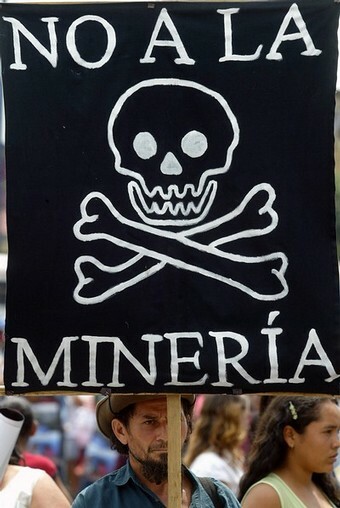 Given El Salvador’s dire environmental state, Environmental Alliance, an umbrella organization that unifies five different environmental coalitions, is demanding that the FMLN government ban large-scale metal mining altogether, stop the use of agro-toxics that are damaging to human health, and end the construction of a series of hydro-electric dams in the north of the country. The alliance wants laws that will protect scarce natural resources and otherwise ensure their use for public benefit. These laws include a proposed General Water Law that would guarantee the public management of water, and environmental risk management legislation to reduce the population’s vulnerability to extreme natural phenomena. “A growing body of scientific evidence suggests that El Salvador could be heading towards an environmental crisis if drastic measures are not taken to reverse environmental degradation caused by pollution, deforestation and the chronic dependence on carbon fuels, pesticides and other agro toxics,” Cabezas tells me. He explains that in 2010, a water quality study by the Ministry of the Environment and Natural Resources (MARN) concluded that only 2% of the country`s surface water had good conditions for the growth of aquatic life. Environmentalists frequently raise the issue of El Salvador’s growing social vulnerability to extreme weather phenomena caused by continued environmental degradation. The country ranked fourth on a list of countries most affected by climate change compiled by the social justice organization Germanwatch in 2012. El Salvador is highlighted on the list “due to its frequent exposure to the impacts of the Atlantic hurricane season,” adds Cabezas. Another report, by the Global Facility for Disaster Reduction and Recovery, claims that almost 90% of El Salvador is at risk to extreme weather phenomena, 95% of the population lives in risk zones, and 96% of Salvadoran gross domestic product (GDP) is produced in these zones. Due to public pressure, a moratorium on mining was enacted in El Salvador by the right-wing government of Antonio Saca that preceded the first FMLN government in 2009. President Funes maintained the moratorium, as has Sánchez Cerén, but neither has been able to fulfill the environmental movement’s demand for a ban on mining, partly because the FMLN does not have the required votes in the legislative assembly to get this passed. Already El Salvador is being sued for $301 million by the Australian firm OceanaGold (formerly the Canadian company Pacific Rim) for not allowing it to mine. Pacific Rim brought the lawsuit before the International Centre for Settlement of Investment Disputes (ICSID), a tribunal based at the World Bank, and new owners OceanaGold have since taken it over. The FMLN agrees with the environmental movement about the necessity for passing a water law that guarantees the people’s right to water, recognized by the United Nations, and ensures public management of water services and sanitation. But here again the party lacks the votes in the legislative assembly; the water law is strongly opposed by the private sector and its right-wing political allies. “The Salvadoran government at all levels operates under tight constraints. Its relationship with the U.S., and thus the influence of U.S. neoliberal foreign policy on ElSalvador, is important for commercial, cultural and political reasons,” says Salazar, citing the 20% of GDP based on remittances from the nearly two million Salvadorans living in the United States. Also, the FMLN does not hold “definitive economic power,” which is “firmly entrenched in a reactionary oligarchy, though the economic reins of power are also being disputed by a newer sector of domestic wealthy elites.” Given this dynamic, President Sánchez Cerén “has many interests to weigh,” says Salazar. In spite of such formidable obstacles, the FMLN and social movements have successfully collaborated to fulfil a critical need for Salvadorans: food sovereignty. According to Salazar, the ARENA administration consistently put its faith in expanding the export-oriented maquila factory sector as a vehicle for generating income and combined this with “a strategic lack of investment” in the agricultural sector, which was dominated by peasant farmers with small plots of land. This resulted in farmers leaving their land for the maquilas, collapsing national food production. When it came to power in 2009, the Funes administration sought to save the agricultural sector and turned to social movements for help. “I would go as far as suggesting that the national agricultural sector policy under Funes was largely borrowed from the longstanding and successful practices of rural social movement organizations like our partner CORDES…that has been working since the years of the popular insurrection [El Salvador’s civil war] for food sovereignty,” says Salazar, pointing out the appointment of former CORDES director Flores as vice-minister of agriculture.